How to outwit the 10,000 CCTV cameras in London shadowing your every single move? We run, and register as nothing more than blurs! Choking in a tiny tropical regime run by a powerful Big Brother – or ‘Neo-Confucianist’ Dear Father that insists on treating citizens like children, how do you register your contempt for the status quo? We run, to reclaim and govern our country, and reclaim and govern our own lives again! How to outrun the encroaching Colonisers? Do we easily give up and give in? No! We run, like the Tarahumaras, who ran, and ran –120 miles a pop, barefoot – to resist the Spaniards from running – ruling – them in the 16th century. Sick of traffic jams? Zip past vehicles, reduce your carbon footprints and lose a few pounds – weight-wise and money wise! – by running, the way Alan Turing commuted! Follow his footsteps, and you may even conceptualise the computer – or some other equally amazing invention since that has already been invented – as the Father of Computer Science did! So, don’t you dare say that running is stupid! For, you would know better if only you’d run! Get your magnificent arses off the chair, as Daniel Shiffman says (which we have rephrased). As the creator of programming software Processing says, ‘I do all my best programming while jogging’. Look – even the most talented computer geeks run to think, too. So, to all our oh-so-precious-highfalutin-armchair critics cloaking their flabby bodies in layers and layers of fat and fabric and fabrication of so-called intellectualism, get a life (or two, or three, or more, as you will learn when you read our explosive thesis). And let it be known that the running process is thinking and ‘inherently philosophical’, as runner-philosopher (YES, WE DO EXIST!! GET OUT OF YOUR LITTLE ROOMS AND BRAINS AND YOU WILL FIND YOURSELF SURROUNDED BY US EVERYWHERE!!) Ross C. Reed says, for, what else is there to do with those hours and hours, when we are running long distances!? When we run, we are not filling in, but replacing the flimsy dandy shoes of the situationists, with our serious, strong running ones – as well as our thinking caps! It is when we run that we alter our consciousness, not from cheap and trashy and oh-so-low-brow and dirty tricks as opium, hashish or alcohol as Walter Benjamin and the two Charles (Baudeliare and Dickens) had had to resort to in order to ‘walk on the wild side’, but from the ‘natural morphins’, or endorphins produced by our brain (PS: Lest you jump into the conclusion that we are some ascetic-anti-hedonist, let us come clean and say that we do so very much enjoy a glass of extra dry crisp white wine or bubbly, or two, or threeeeeeeee, or thirty-threeeeeeeeeeeeee). Not only that – the brains of running nuts in the form of ultra-runners (who run more than 26miles a pop) generate a stimulation of neurotransmitters that is akin to the ‘mystical/mythical state’ otherwise only attained via meditation and certain rituals, as ultra-runner-anthropologist Peter N. Jones proposes. When we run, we are undertaking what nomad-writer Bruce Chatwin calls ‘journeys of the body and mind’. When we run, we hit 1 foot on the ground, and the other in blue skies, in lala land, like Don Quixote on his mad and marvellous trip / trips. When we run, we let our imagination run wild, while fully embodied (far from being seen as limitations/problems/obstacles, we do LOVE our bodies, blemishes and all, so all them so-called enlightened cyborgs and transhumans and posthumans and the church who think our bodies are filthy and sinful and etc, get real). Of course you wouldn’t know that when we run, we are meditating in motion, like the Daoist arts of taiji – minus the exotica. After all, the Chinese character of dao [?] – a path or way – is composed of the human head and the feet. (By the way, that wasn’t too exotic for you, was it?). And the Chinese sure understand the importance of the feet (wasn’t that also why their silly males bound the women’s?? ), as the source of our well-being (just look at the popularity of foot reflexology to this day)! 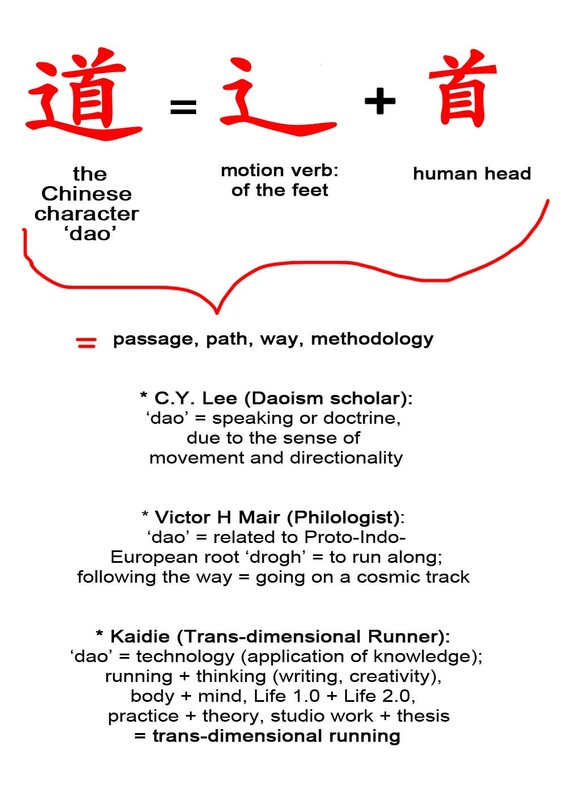 With our body as the centre and our feet as the groundwork of our being, we are grounded against over-intellectualisation, and subvert the limitations of language with what Daoism scholar Kuang-Ming Wu terms ‘playfulness and indirection’, as Lao Zi and runner-physician-writer George Sheehan teach us. Not only do our bodies form a correlation, a network, a path, a way – a dao – with our minds, it is directly mapped with the environment in which we dwell. With running, especially long-distance running, outdoors, we understand more profoundly the Daoist formula that our body is our cosmos, and our cosmos is us. It is only when we have a healthy body, that our mind, society, state, and world, too, is healthy. Hence, when we run, we can ‘dominate and transform’ our world, and not just the other way around, as Daoism scholar Kristofer Schipper tells us. A few ways (daos) of the way (dao)! And what a world we live in, with so many exciting stages to play in, especially today. Apart from the physical dimensions of the cosmos (which we term ‘Life 1.0’), we can now run our brave new technological worlds, which philosopher Michael Heim has described as nothing short of an ‘ontological shift’. Online (which we call ‘Life 2.0’), we can run wild, run amok, from site to site, window to window. After all, as Sherry Turkle says, reality is ‘just one more window’. Give birth to yourself with (a) Second Life! Or Ninth! Or Ninetieth! Sick of one? Simply type up an other virtual one! After all, like in a video game, we can live, and die, and live, and die, to our hearts’ desire. Run the gamut of personalities that you can never be! That you (believe that you) have yet to become! That you have left behind! Play different roles! Run and leave confusing traces at every stage, so that neither online companies, crooks nor cops could ever shadow and profile you! Run your Internet lives as you would run a show – from a remote, critical distance! Like what Daoist sage Zhuang Zi and his butterfly dream teaches us, be attached to neither the dimension of the virtual nor the real. That way, we will be sucked into neither William Gibson’s ‘consensual hallucination’ of Cyberspace, nor be overly seduced by meatspace, for that matter. This double vision is vital especially today, when the internet spills all over to the physical world (what we call ‘Life 3.0’). With your smartphones and computer tablets, we are emancipated from the desk and room, and are mobile once again. With the whole (virtual) world in your hands, we return to our bodies, and the physical worlds, and run, even further, as digital nomads, reconnecting the digits of our feet with the ones and zeroes in the ‘ether’. Like the playful and anarchic Lao Zi and other Daoist sages, we traverse the hybrid worlds, freely. And why restrict yourselves to only running within each dimension (what we call ‘intra-dimensional running’)? Run across, to- and fro-, in the ‘chaosmos’ (as we appropriate from Daoism scholar Norman Girardot) of our physical, virtual and hybrid realities (which we christen ‘inter-dimensional running’)! Thrive in what Daoism Scholar James Miller calls a ‘creative, dynamic harmony’ and enjoy the best of both, or more worlds. And, if you have really good stamina – and, trust us, you will, with all your training! – we can even run beyond (what we call ‘Life 4.0’) these stages, and go on ecstatic journeys, like the Daoist poet Qu Yuan and the marathon monks of Japan who run 40,000km in 1000 days, to seek enlightenment! 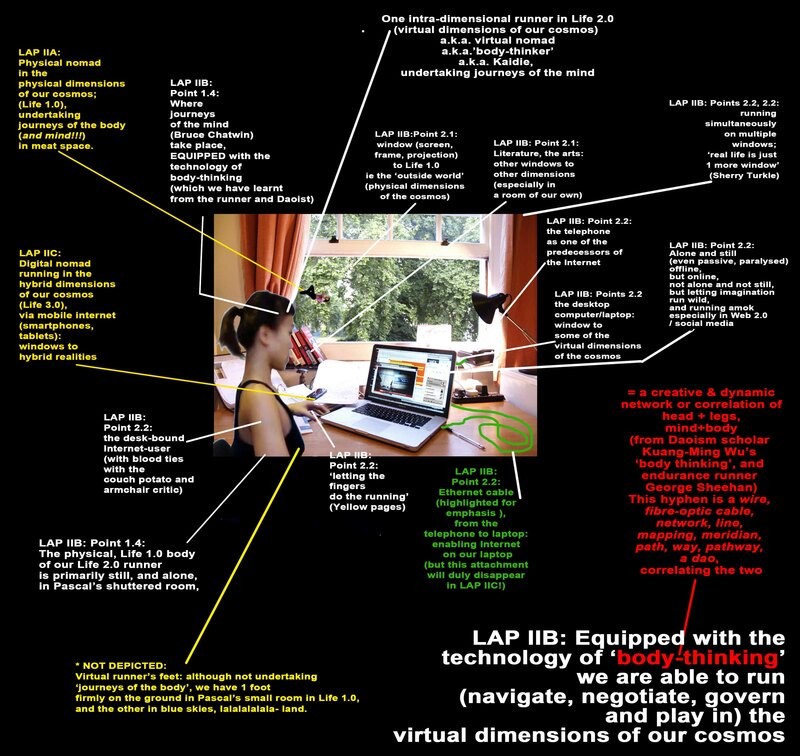 A diagram illustrating how we run the virtual dimensions of our cosmos (chapter, or Lap IIB, of our amazing thesis). 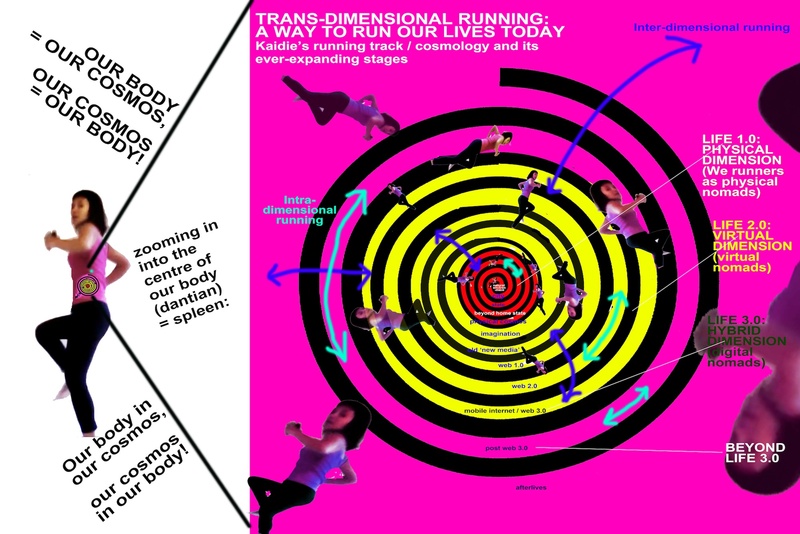 ‘Trans-dimensional running’ (= our amazing ‘intra-dimensional running’ + ‘inter-dimensional running’, ie, running within + running to-and-fro dimensions) is a way for us to ‘run’ – navigate, negotiate, govern and play in – our cosmos, today. With trans-dimensional running, we run a line, a wire, a fibre-optic cable, a meridian, a vein, a path, a way, a pathway, a dao, between mind with body, thinking with writing, theory with practice. 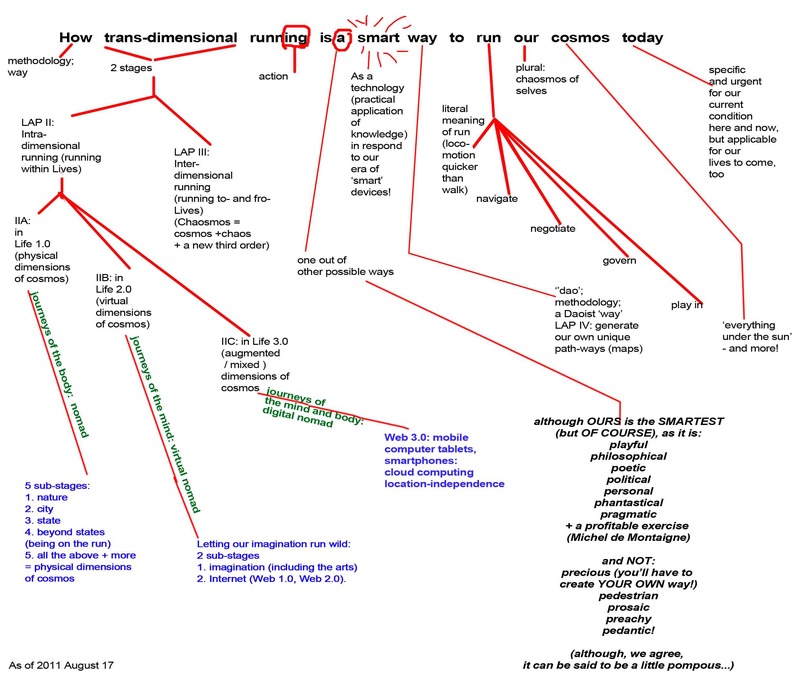 In the process, we map diverse disciplines to generate new knowledge and new pathways, linking philosophy with technology, science with art, the popular (what Sheehan terms ‘running mania’) with the so-called esoteric (insofar as ‘the west’ is concerned, that is) (Daoism), old with the new, our past with future, the East with West, analogue with digital. The no-technology locomotion of running, informed by the ancient way-of-life of Daoism, is re-contextualised in our technology-saturated age, allowing us to re-examine our current condition afresh. No, no excuses! YOU can run! We are born to run! Don’t you recall how, soon after you could walk as a toddler, you ran? Happy days! Wasn’t that fun! Weren’t we free! That was why they – our parents, teachers, the adults – shouted: ‘Don’t run! Walk!’ In fact, runner-anthropologist Daniel Lieberman (together with biologist Dennis Bramble) has uncovered evolutionary evidence to say that our bodies are built to run (such as the nuchal ligament on our neck, our large posteriors and tendons, and ability to sweat), and that running has ensured our survival as human beings, in the form of endurance hunting, for 2 million years! As philosopher Blasé Pascal proposes, and what Bruce Chatwin, runner-physician Mike Stroud, and Daoism scholars Livia Kohn and Kristofer Schipper confirm in so many ways, it is when we stopped moving, settled down, began farming, and built rooms (and cities, and states), that explains all human beings’ unhappiness; it is when we stop moving and stop aligning our internal systems with that of nature – be it the revolutions of the Earth or the creative, dynamic harmony of the Dao – that explains not only our physical and psychological ills, but that of our societies and states. For Chatwin, it is this same restlessness of misalignment, that propels such figures as Che Guevera to chase his proverbial antelope – run after his dream – and undertake revolutions. So, don’t worry if at first, you pant. Fulfilling the Daoist dictum of yangsheng (and the videogame dictum of ‘the more you play, the better you become’), the more you run, the further you can run, and the better you run! The more we run, the bigger our minds are (unlike that of Nelson Mandela’s captors’, which he has said were narrow because they were filled to the brim with hatred and bigotry and hence, like their prisoners, were themselves prisoners, of their own minds). Not only that, your heart pumps better, and physically, literally, really really grows bigger too, as runner-physician Mike Stroud tells us! Not only is your body better and stronger, so is your cosmos. With bigger hearts, we must agree with writer Haruki Murakami and Ethiopian long-distance champion Haile Gebrselassie that, if only the whole world was run by runners, it would be a better place! Sit around and let them walk all over you? No way, for, we are action figures, who act, who are active, who activate. We are neither passive, paralysed or poorly! Walk out of unpleasant circumstances, jump into rabbit holes, allow things to come to a stand still, or take flight and be a coward? That’s all too easy, for, no pain, no gain! In contrast to graffiti, skateboarding, basejumping or parkour, running is not only legitimate but can be embedded in our everyday life. And, unlike the Kraftwerk-ers we need neither machines nor bicycles for our mission – simply put 1 foot ahead of the other, and there we go! Fulfilling the Daoist principle of wuwei, anyone can run, anytime, anywhere. And make sure that your ‘swift transient passages’ are faster than the situationists’ stroll! Build into a sweat, get your muscles warmed up, your heart racing, the ball rolling and your creative juices flowing! Want to create mindblowing, mindbending metaphysical novels? Then you must begin from the physical – with running, as Murakami did everyday he was writing his critically-acclaimed Kafka On The Shore! Hit by writer’s block? Run, as Joyce Carol Oates does. Hit by fallen rocks and imprisoned underground? Do you lie there and ‘wait to die’, or do you, like the angry young Chilean miner Edison Pena, get up and run, in defiance, to make the ‘mountain’ (the fallen 8 feet of soil) ‘bored’? Run, and be free, as Colin Smith, the angry young prisoner of The Loneliness of the Long Distance Runner is. Run, and because running is more vigorous than walking, we lurch about, and when we lurch about we are stirring the stale, airconditioned air of prosperous tropical countries. Run, and hence generate your own maps to replace that saturated by the vulgar spectacle of shopping mall after shopping mall, casino after casino, built on tiny paradise-islands reclaimed again and again, that is otherwise too small to bury us after we die or house us while we are (hardly) alive. Be on the run, to continue our fight from a distance. No, we are not running away, but saying that we refuse to play to their rules. Run, and we not only tear ourselves from what Frederic Nietzsche has described as society’s ‘herd’, but the herders, Big Brothers, our captors, walkers, and other non-runners. Run, and break off from chains everywhere that Jean-Jacques Rousseau says we have been shackled. Run, like Lola of Run Lola Run, and defy and change your fate (or fates). When we run, we run our own fates, bruise our own toes, our feet not bound into ridiculously misshapen Chinese feet that the silly Chinese men have bound us in before. When we run, we are also no longer small, foreign objects fulfilling anybody’s laughably anachronistic orientalist fantasies, but standing – or rather, running – gigantic, proud locals sticking two enormous (sweaty) fingers up at their even more laughably minute organs of their minds (What, do you call that your organ?? Is that all you’ve got?? Try HARDER, won’t you!!). When we run, we outrun danger, the way no walkers can. When we run, we subvert their gaze – they are merely onlookers and bystanders, while we run the place. And no, we are not ‘a great way to fly’, who kneel down to serve you drinks midair, award-winningly, world-famously, in useless dainty faux-exotic costumes and slippers, that you can hardly walk in, let alone run. For fuxakes, we run, physically, metaphorically, metaphysically. We are runners. Well, catch us, if you can, we tease. So, come, run with us – Kaidie, Kai Syng Tan, writer, runner, performer, and your Guide, online and off, here, there, everywhere. We are not just any ordinary guide, mind you, but a Rough Guide. You see, this is but a guideline. You, as our Co-Runner and Co-producer, are free to make your own correlations. Run and generate your own paths, your own dao! Mobilise your feet, and generate our own GPS drawings and maps! Afterall, a discourse refers to refers to ‘a running from one place to another’ in the latin. Generate your own discourse, draw your own conclusions, and run your own lives! It’s urgent! We urge you! To Run! Now! Run for your lives! Run, and we are fit for life! Not just for this, but other lives! Trans-dimensional running is a visceral counterstrike and celebration of our Internet-expanded lives. Never pedestrian or prosaic, preachy or pedantic, our way of trans-dimensional running is a playful, philosophical, poetic, political, personal, phantastical, pragmatic ‘profitable exercise’ (Michel de Montaigne), for us to run – navigate, negotiate, govern and play in – our mad and marvellous cosmos today, as well as subsequent stages of lives to come. (Yes our fabulous thesis does sound a bit ppppppompous, but it’s certainly far from precious!) Are we ready for the best run of our lifetime(s)? Remember that it’s a long run, and it’s for the long run! It might get tough going, but you’ll be delighted to see the finishing line – which you will have to draw, and run to, yourself, of course! Enough said. Let us now walk the talk, or rather, run the run! As of 2011 August 9; this blurb is, obviously, dynamic and non-conclusive. (A question, for instance: Is the rioting in Nondon (and elsewhere) a symptom of Internet geek-entrepreneur Seth Priebatsch’s notion of the ‘gamification’ of our everyday life one step too far? Haven’t we been there with the situationists and Anthony Burgess’ Clockwork Orange, but on a more pervasive, viral [in many senses of the word] manner as facilitated by social media? Can running be the legitimate – and civilised, and more playful, more interesting, more intelligent, more eloquent – alternative form of expression in this case?) Happy national day, by the way. This entry was posted on Monday, August 8th, 2011 at 15:10	and is filed under MAPPINGS. You can follow any responses to this entry through the RSS 2.0 feed. You can leave a response, or trackback from your own site.